Caring For Orchids: Let me introduce a somewhat radical concept of caring for orchids. How about the idea of orchids as friends and allies from the plant world? Orchids are these incredible, beautiful, exotic plant life forms that we invite into our homes and greenhouses to enhance, beautify and purify spaces where we live. Orchids are not only alive, wonderful life forms that are willing companions on the path but also creatures that support us by giving beauty to our lives, stimulating our intellect and our senses and purifying the air that we breathe. What do they ask in return? Not much really. It is a given, that you will want to care about plants. You need to understand that like all plants, orchids are a life form, capable of change, growth and reproduction. Like everyone and everything they just want to be happy too! How well they do in your care depends on how well you can provide them with what that individual orchid needs to survive and thrive! Just a few of the plant basics are required in caring for orchids. And so here are the primary areas you need to consider: Light, Temperature, Water, Humidity, Air Circulation, and Fertilization. The first step in caring for orchids is to take a close look at the available conditions. How much light is there, what are the temperature ranges of your growing conditions? These are the two primary conditions that you will want to consider first as they are the most difficult and expensive to modify. Other factors such as water quality, humidity and ventilation can be more easily altered. Light: The kinds of orchids that you grow will depend on the kinds of light you can offer them. Some of the more popular orchids, like Phalaenopsis prefer bright indirect light, others like Dendrobium's will, like medium light in the 2000 - 3000 foot-candles range. So consider what kind of light you can offer. Will you grow in your house? What directions do your windows face? Can you grow on or near a windowsill? Would you consider growing under lights or with a lighting system? Determine what you can offer and find a plant to fit that light regime. Or if you have orchids already, find out what kind they are and what they need in terms of light to thrive. Most orchids, like most people prefer the temperature ranges and intermediate range. And this is in fact what most of our homes provide just most of the year. Water: If you have managed to put the right orchid in the right light and the right range of temperatures, all that remains for you to be successful in caring for orchids is to have right watering and right fertilizing regimes. One rule that I cannot emphasize enough is to never leaving orchid in standing water. A second rule would be to avoid over watering your orchids. Over watering is a typical mistake that beginning orchid growers often make. What many people do not understand is that orchid roots don't just need water, they also need air. Many of them are epiphytes and are accustomed to have their roots growing openly in the air. Like many things with caring for orchids, there is no simple answer as to when to water. It depends very much on the kind of orchid. And it is very dependent and other factors such as temperature, lighting, humidity, media, time of year and so on. Humidity and Circulation: Most orchids like to live in an environment that is generally more humid than our homes. As a rule of thumb humidity of 40 % - 70% works well. There are ways to increase the humidity right around the orchids themselves. The best method I have found (and use extensively myself) is to use a humidity tray. Please check out this page for the ones that I use and think are the best. Additional air circulation can be accomplished in the home by a carefully placed fan that provides a very gentle additional breeze near your orchid plants. 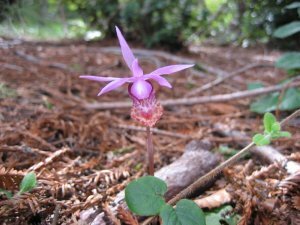 Fertilization: In the wild orchids and particularly epiphytic orchids get their nutrients from the decaying organic matter that collects near their roots. Orchids that grow in the ground (terrestrial orchids) obtain nutrients from the soil itself. These nutrients are very dilute and it is best to feed your orchids in this dilute manner. 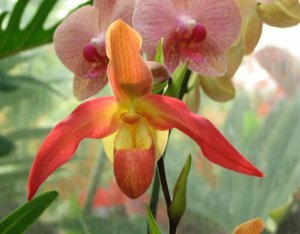 The adage is to fertilize orchids “weakly, weekly”. I like to use about one quarter of the recommended strength of the label. And generally I fertilize every 3 or so waterings. It is important to fertilize when plants are actively growing. I almost never fertilize in the winter time. Pests and Disease: Other factors in caring for orchids are pests and disease. Orchids like many other plants that have been in cultivation for a long time are susceptible to both pests and disease. Pests that can be a problem are aphids, spider mites, mealybug, scale, slugs and snails. Diseases that can be a problem are rots caused by both fungi and bacteria. Orchids can get spots on the leaves which are usually from fungi. They can get blights which are also usually from fungi. And they get viruses. How one deals with orchid disease depends on which disease is present and how far it has advanced. As with other plants, orchids can have cultural problems as well. The primary ones are over watering, under watering, over fertilization, mineral deposits, sunburn, too much or too little light, air pollution, bud drop, pleated leaves, improper planting, improper media and weeds. Each one of these problems has its own remedy. So this has been a basic overview of caring for orchids. Following the links to the other pages will let you explore a particular subject of interest in more depth. This page on caring for orchids will expand on the various factors for orchid growing success. Good luck on your orchid growing journey!